To ensure that no voter is left behind, the Voter Awareness Forum was launched today in the District at Buddha Park Bomdila. Outdoor activities to commemorate the launching of VAF was orchestrated by the Electoral Literacy Club of Govt. College Bomdila and Sec. School Kakaling. 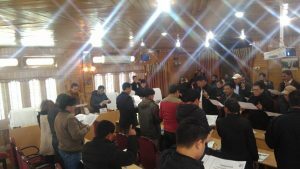 AERO P. Monpa, EAC and DNO (SVEEP) G.Taga, DIPRO reiterated on the importance of SVEEP and opined that VAF activities would go a long way in facilitating electoral participation in the District. A PPT on VAF and VVIP was made by the DNO SVEEP followed by activities like registration, name check and build the ballot for the HODs and other representatives from the various departments. A demonstration on EVM and VVPAT along with pledge on ethical voting was administered to mark the occasion.